Boothville, Louisiana, July 2010. In 1968, gadfly Andy Warhol said "In the future, everybody will be world famous for fifteen minutes." Since then, the quotation has been bastardized and misquoted. Nonetheless, the message was clear for "Super Oil Skimmer 'A Whale,'" "Your fifteen minutes have expired." On July 1st, at the height of the oil disaster in the Gulf of Mexico, a "Super Oil Skimmer" entered the Gulf with extensive curiosity and whoop-de-do by the press and public! 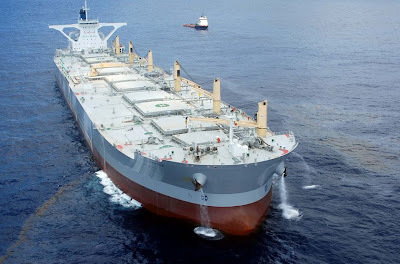 Nobu Su, an entrepreneurial Taiwanese executive, who owns a fleet of Very Large Oil/Ore Carriers, had modified his newest tanker to skim Louisiana Light Sweet Crude, gushing from the wreck of the "Deepwater Horizon." I detailed these auspicious beginnings in "A Whale Demystified." "A Whale," like her sisters "B Whale" and "C Whale," (with "D Whale" and "E Whale" under construction at Hyundai Heavy Industries in South Korea,) were designed as Very Large Oil/Ore Bulk Carriers (VLOO). Being too wide to transit the Panama or Suez Canals, these massive 1,150-foot long "Capeships" ply the oil and iron ore trade between South America, North America, Europe, and the Far East. Furthermore, they are specially designed to carry crude oil or bulk commodities such as cement, grains or iron ore. This capability - to carry liquid or solid cargo - eliminates wasteful, non-revenue generating "dead head" trips across the Atlantic. VLOO's (Very Large Oil/Ore carriers) are identified by deck-mounted cranes, used to open and close hatch covers. Red arrow points to crew man, giving scale to the size of this vessel! Hatch covers that must open from right to left, yellow arrows, as we will learn more about. The girder-like crane handles hoses for loading oil cargo through the manifold at right. "A Whale" ended up discarded by the press and public following three weeks of disappointing skimming demonstrations on the Gulf of Mexico. 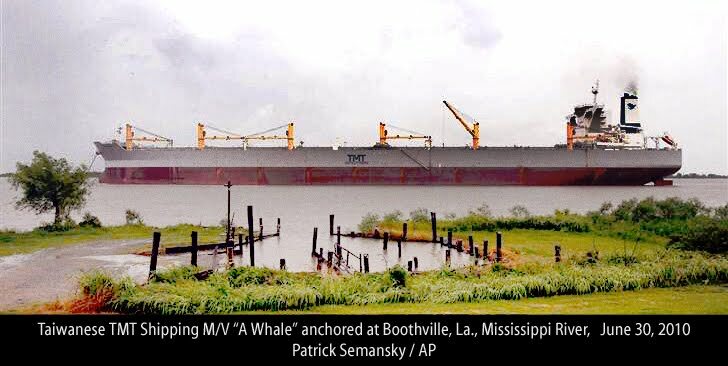 She spent several weeks brooding at her Boothville Mississippi River anchorage. 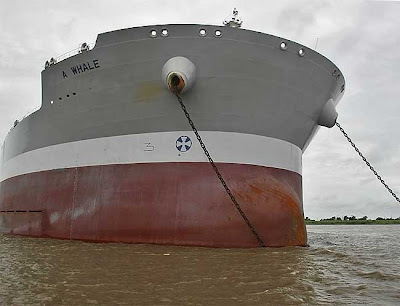 Finally, at the end of July, "A Whale" quietly heaved anchor and silently exited the Gulf of Mexico, bound for Sao Luis, Brazil. "B Whale." Also newly delivered, "B Whale" was in Singapore bunkering. 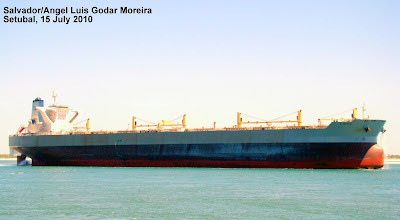 She received orders sending her to Portugal in late June, to become the second "Super Oil Skimmer." As she was arriving at the same yard where "A Whale" was modified, it was becoming clear that her sister was not effective as a "Super Oil Skimmer." "B Whale's" surgery was canceled and she was dispatched to Sao Luis, Brazil. "C Whale." While her sister "A Whale" was floundering in the Gulf, and "B Whale" was enroute to Brazil, "C Whale," launched in June from Hyundai Heavy Industries in South Korea, was sent on her maiden voyage to Singapore. Plans were also dropped for her hull modifications. Following several weeks bunkering and taking on supplies, she too was sent to Sao Luis, Brazil. 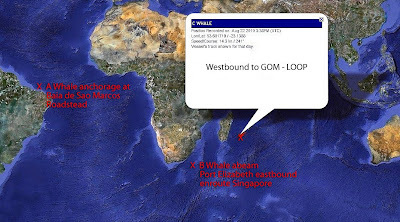 GPS vessel tracking reported this unique snap shot of the relative position of each "Whale" on Sunday August 22nd. So all the "Whales" have been accounted for. 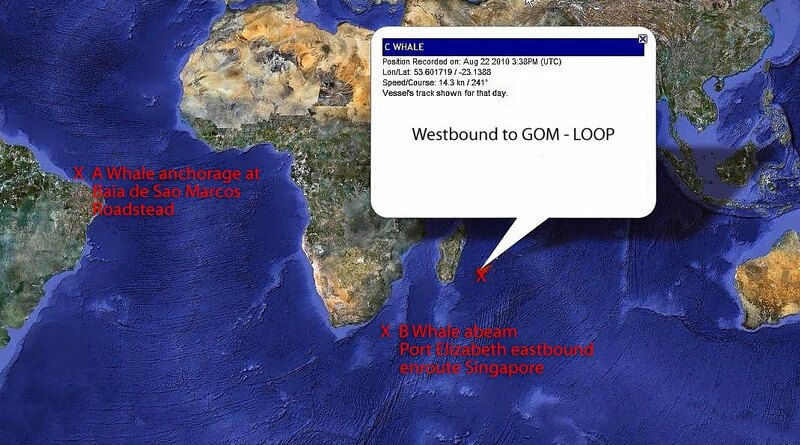 Moreover, all three "Whales" have been sent to Sao Luis, Brazil. That is all very interesting, but how, in blue blazes, you are asking, does any of this connect with railroading? Iron ore binds the three "Whales" together with railroading. Iron ore, to be loaded at Ponta da Madeira (PDM) located on the northeastern coast of Brazil at Sao Luis. "A Whale of a Tail"
"A Whale Super Skimmer or"
"Sir! Freight Train Dead Ahead!" Many "Students of the Road" do not realize the Milwaukee Road ran a tug and rail barge service for more than four decades on Puget Sound, and had wharfs in Seattle and Tacoma for transshipping freight from rail to deep sea steam ship! 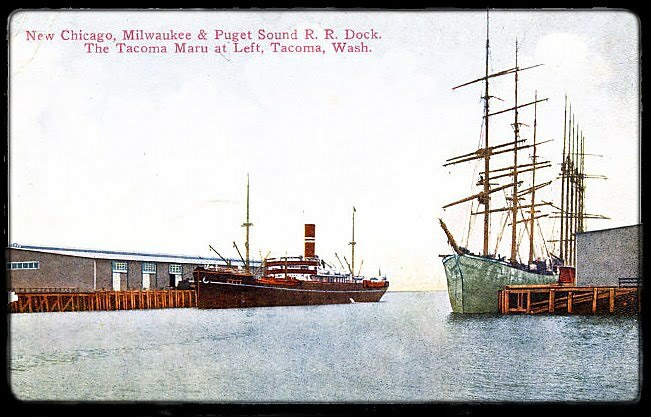 By the time the Chicago, Milwaukee & St. Paul Railway reached Puget Sound, competitors were firmly deep-rooted in Seattle and Tacoma, with access to lucrative lumber mills. 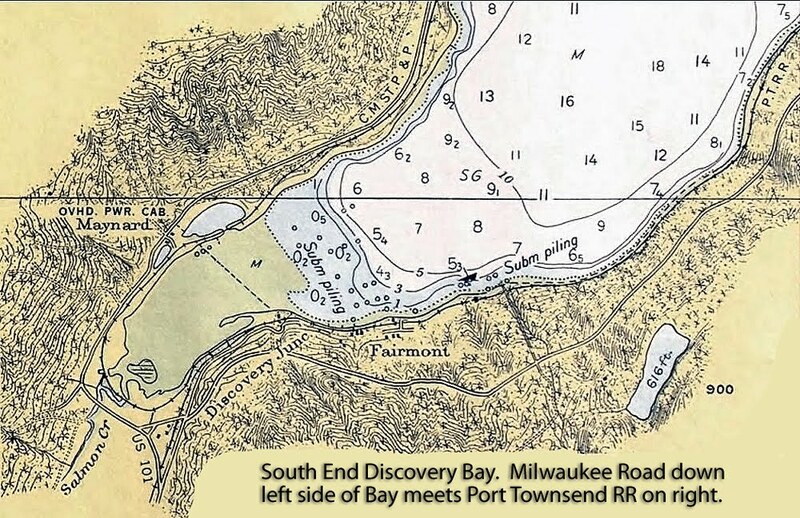 To overcome this situation the Milwaukee Terminal Railway Company was organized and incorporated under the laws of the State of Washington in April 1905. 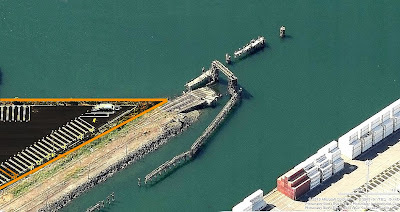 The purpose was to construct rail bridge ferry landings and trackage to operate car ferries from two terminals; Seattle and Tacoma, to access important tidewater lumber mills located on Puget Sound lacking rail facilities. 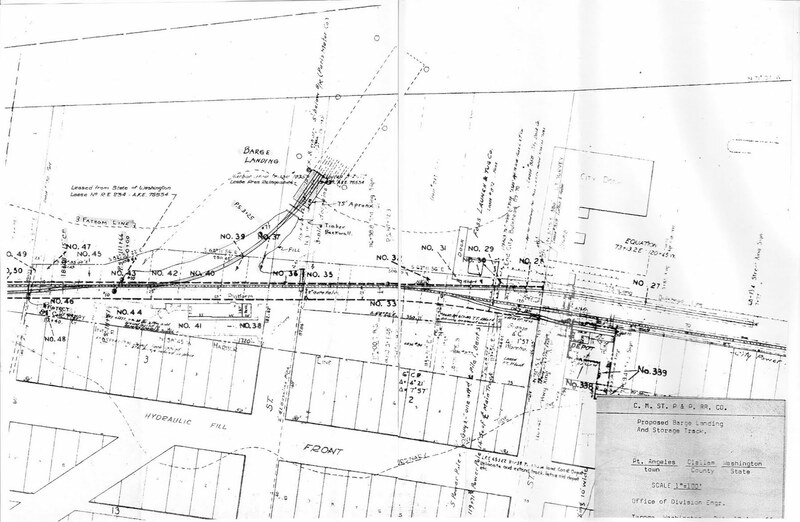 This was a clever move in many ways, eliminating the need to construct hundreds of miles of overland trackage, made more difficult by the convoluted terrain of the Puget Sound Region. The Port Angeles Rail Bridge operated for a very short time, 1913 to 1915, when the final rail link between Port Angeles and Discovery Bay was completed. Click to enlarge. 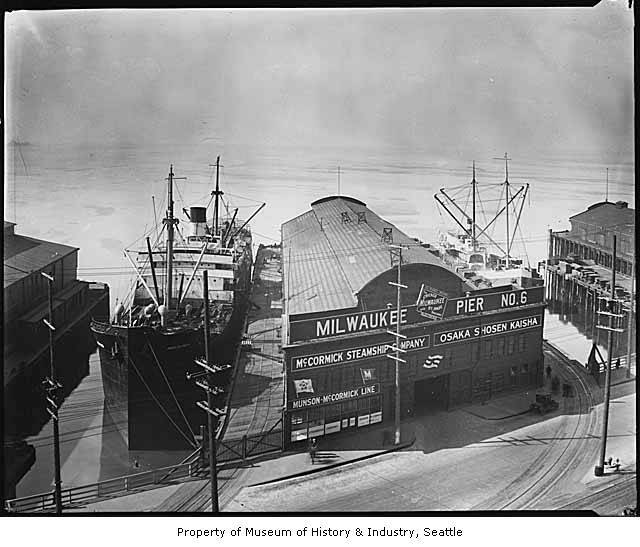 Rail-heads were established in Tacoma, and at Pier 27 on Elliot Bay in Seattle. 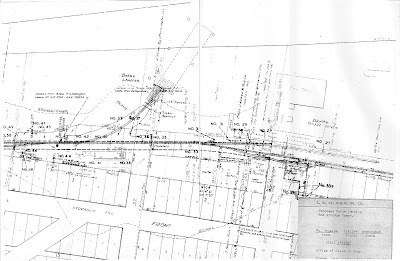 Landings were constructed and service inaugurated connecting the Bellingham and Northern Railway Company at Bellingham; the Seattle, Port Angeles and Western Railway at Port Angeles and Port Townsend, and Port Gamble. 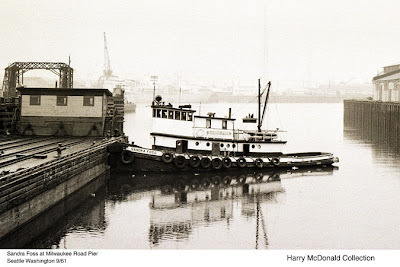 To complete the strategy, car barges were constructed, and a towing company chartered to tow the barges from Tacoma and Seattle, to the distant mill towns. 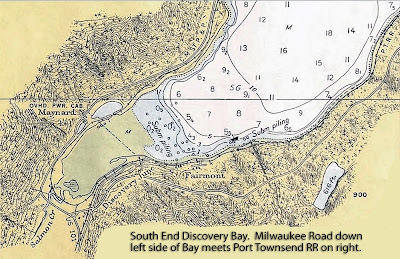 This water born traffic, together with the operation of the Front Street and Commerce Street Lines at Tacoma, were operated by the Milwaukee Terminal Railway Company until December 31st, 1915, at which time the property of that company and its operation, was taken over by the Chicago, Milwaukee, St Paul & Pacific Railway Company. To better manage the marine operation, the Milwaukee Road decided it best to own their own tugboat and crews. 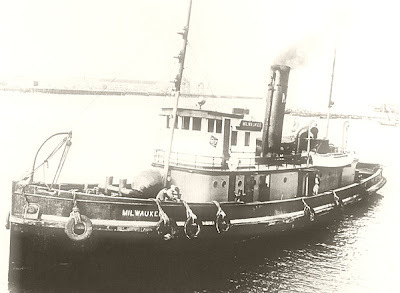 To accomplish this goal, a first-class steel tug, the "Milwaukee," was ordered from the Seattle Construction & Drydock Company, at a cost of $100,000. 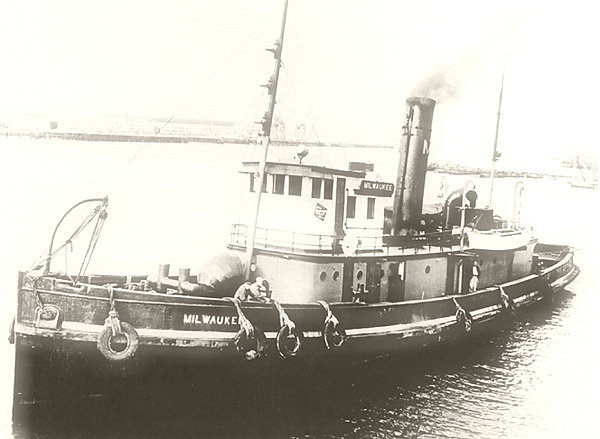 The "Milwaukee" was launched on January 22, 1913, christened by Miss Imogene Calkins, daughter of the railroad's Puget Sound traffic manager, R. M. Calkins. 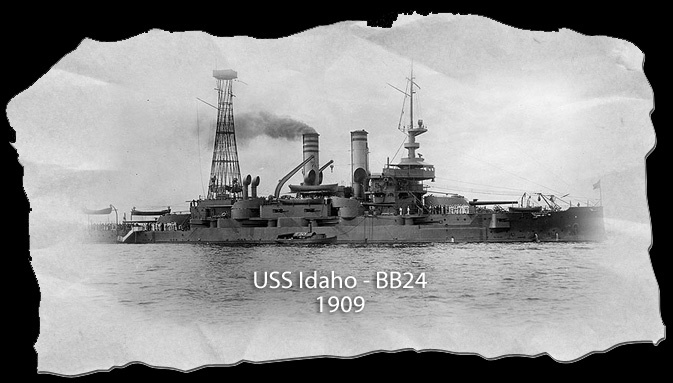 She, of course, was painted Milwaukee orange with black hull and white highlighting, a handsome vessel indeed! Engine: Triple Expansion (15", 24", 38" x 24",) single-ended Scotch boiler, developing 1,000 horsepower at 150 pounds pressure. In 1954, the Milwaukee Road retired the tugboat, ending 41 years of reliable service on Puget Sound. 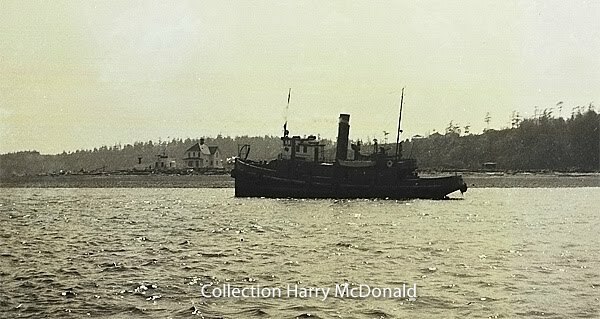 She was sold to Foss Tug & Barge in Seattle. Foss decided not to re-power the aging hull, and scrapped her in 1956. 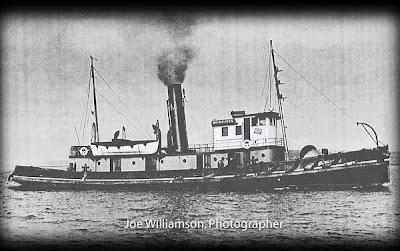 Foss Tug & Barge continued the contract with the Milwaukee Road, servicing Port Townsend and Bellingham. I have not been able to determine when the last trip to Bellingham occurred; but the last trip from Port Townsend was documented on March 25, 1985. 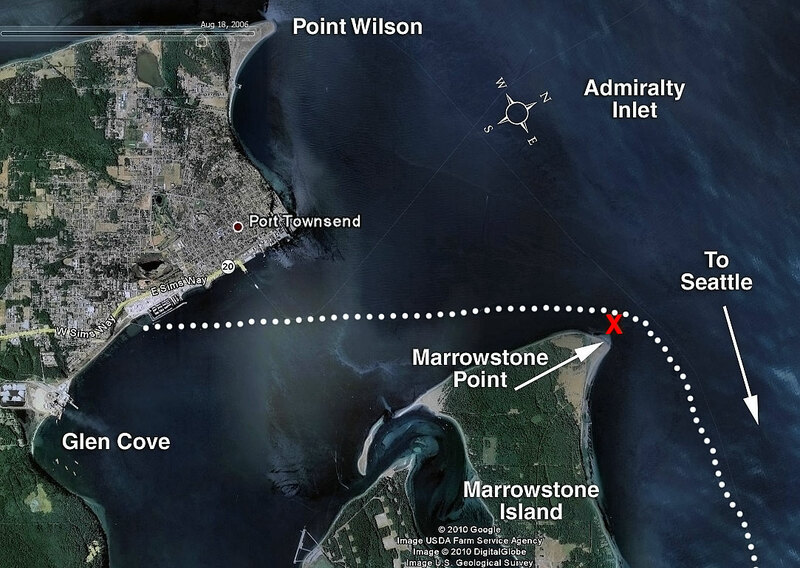 Marrowstone Point Light, Marrowstone Island, Puget Sound. 1952. 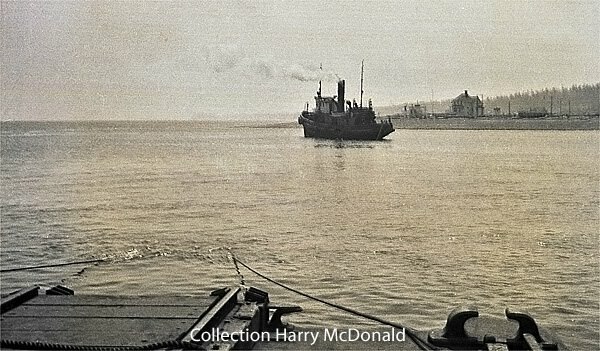 I have a large collection of marine negatives; mostly tug boats, left by my late Dad. 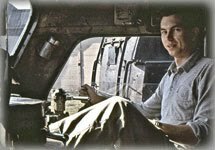 He was an extraordinary "amateur" marine historian. 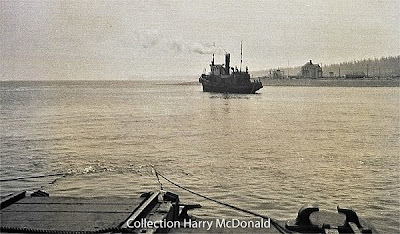 Dozens of his meticulously annotated photo albums, containing complete fleet histories, have gone to deserving individuals and public collections. 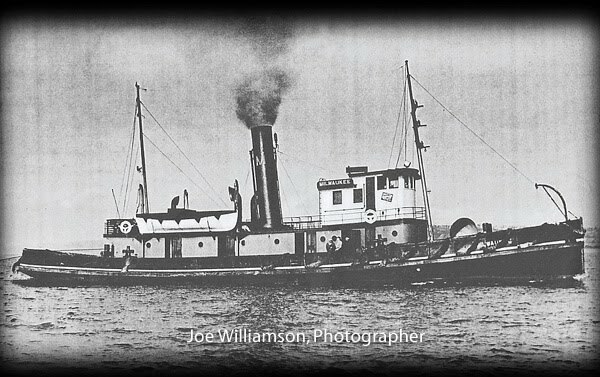 One is on display at Oakland California on the S/S "Red Oak Victory." I was rummaging through the negatives when I noticed an envelope with a sparse notation, "Tug (US) Milwaukee Aground, 1953." Three negatives tell the story of a tugboat aground somewhere on Puget Sound. 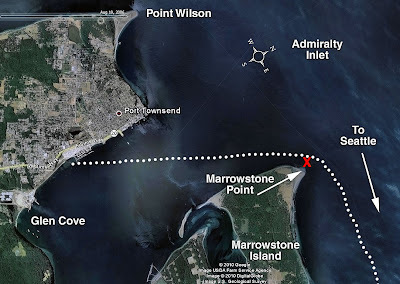 Through careful research of Puget Sound Lighthouses, I was able to identify the location as Marrowstone Light. 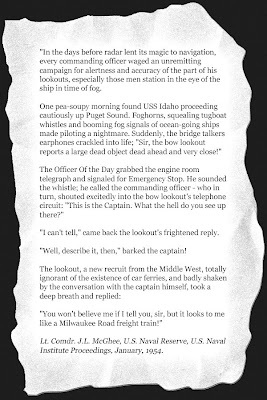 Furthermore, the "Milwaukee" having departed Port Townsend, was rounding close abeam Marrowstone Light. She apparently cut the corner short, or perhaps got hit broadside by the tide flooding through Admiralty Inlet, stranding with a loaded rail barge! From Dad's sea documents, I determined he was working for Puget Sound Tug & Barge out of Pier 59 in Seattle, as 1st Assistant Engineer on the "Active." The set of negatives suggest the "Active" was sent up to pull the "Milwaukee" off the ground, with a second tug dispatched to take control of the rail barge. This photo was taken looking south from the rail barge, with the stranded "Milwaukee" and Marrowstone lighthouse to the right. Seattle to Port Townsend: 7,176 round trips, 76 miles each way. Seattle to Bellingham: 3,946 round trips, 156 miles each way. Seattle to Eagle Harbor (Winslow) 576 round trips, 16 miles each way. Byron also found the "Milwaukee" had made 288 trips up to Port Angeles before that facility was abandoned, and during WWII, numerous trips to the Navy Yard at Bremerton, for another 100,000 miles. In all that travel, over 41 years, the only replacement was of the Scotch Boiler. Much credit for this remarkable achievement goes to the Chief Engineer, Clifford Rowe, who ruled the engine room for 38 of those 41 years! Her last Master was Captain Ed Lee. When these figures were compiled in 1954, only three other vessels had crossed the Million Mile Mark on Puget Sound, all Washington State Ferries. I was able to find records for two Milwaukee Road rail car barges, the Milwaukee Terminal (MT) MT-20 and MT-21. Apparently retained the same Milwaukee Terminal Railway Company number. Although I cannot verify, the steel carfloat barges probably constructed by Reliable Welding of Olympia, Washington in 1944.